I presented a short talk called Tweaking Scrum at Agile Day Twin Cities 2017. I hope to write a longer post on it, but for now, here is the slide deck, as well as notes from the followup open space discussion. Sutherland emphasizes that teams adopting Scrum must have a commitment to change and to take your company into the future. Without embracing this change, "you can't get there" and Scrum will be of little value to you. Schwaber highlighted that focus to work on nothing but the sprint goal will yield the best results; working on other items destroys your productivity. Sutherland noted that doing twice the work in half the time is only possible if the teams focus on the sprint goal alone. Stakeholders and the team alike need to have a spirit of openness. Sutherland stressed that all happenings must be visible; only when everyone knows what is happening can you best decide how to adjust and how long work will take. We should go so far as not to work on anything that isn't visible. These are only possible with respect for each other; blame and cover-ups result in poor outcomes. If we respect everyone where they are, they can be empowered to grow and achieve. Sutherland says this applies even to high-pressure cutthroat venture capital-driven startups. Schwaber stresses that respect creates a positive hubbub, a buzz that is charged up with work getting done. Courage, both to do the right thing and to attempt hard things, is necessary because change is risky. Leaders have a big role to encourage taking wise risks and accepting the downside that sometimes results. Schwaber emphasizes that Scrum provides a safety net--you will never waste more than a sprint's worth of work. Scrum has the power to make your work life more fun, more balanced, and happier. View the Scrum Guide: http://www.scrumguides.org/scrum-guide.html - The newest changes are near the beginning, under "Scrum Values". 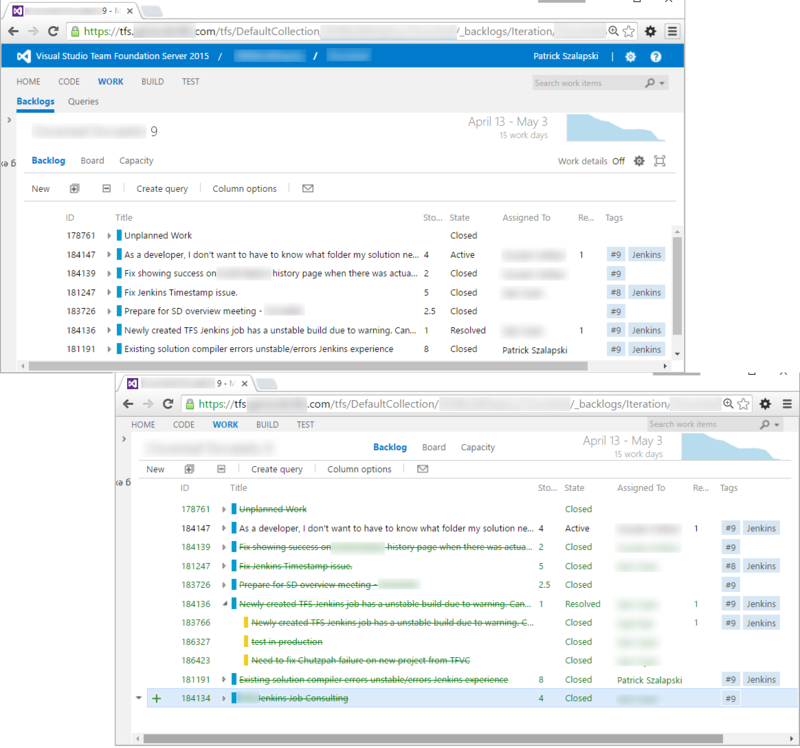 UPDATE 2016-05-06: Now supports the TFS Product Backlog, Board, and Sprint Backlog, with resolved/closed work items green and crossed-out, as well are much improved User Story (Kanban) board. Do you want your UI controls and whitespace cruft taking up half your browser window, like the default view in the first image? Wouldn’t you like your TFS backlog to instead show as much info as possible, as on the second image below? Then, whenever you have TFS web work items or task board open and you want to see more content and less cruft, click it. Be sure to use "full screen view" in TFS and in your browser as desired. I’ve also made the 2015 version available as a gist. 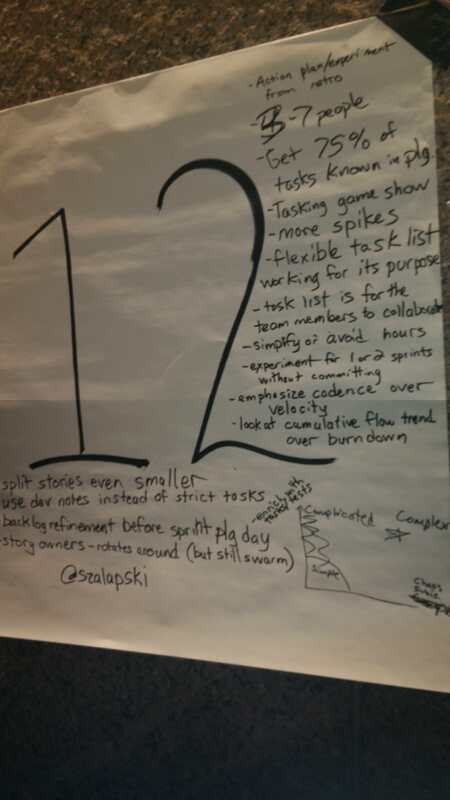 I really like Michael James's Scrum Master's Checklist to give us an idea of the work a Scrum Master can do to make their team the best. However, it doesn't really show the basics of being a Scrum Master, so the following should help with that. Ensure the team has updated the hours remaining on all tasks. Update and post the burndown chart. Schedule the sprint review; arrange for stakeholders to attend it. If the stakeholders can't attend the Sprint Review, reschedule it. Neglect Scrum Master duties in favor of "regular work"
Once you have the above under control, consider additional duties from the Scrum Master's Checklist.